"After a long and cold winter, there is no better way to welcome spring than with a vibrant and fun Easter party for inspiration. This recent styled shoot at Amber Lakes did just that. Full of light and colour, it made for the perfect Easter setting. Set in the countryside and surrounded by water, this venue is an idyllic retreat away from the hustle and bustle of London. We were lucky enough to work with some incredible suppliers to piece together a beautiful afternoon. MonAnnie style the most beautiful cakes and confectionery. Director and owner Fehintola shares her inspiration for Easter. I wanted to celebrate the freshness and beauty of spring. 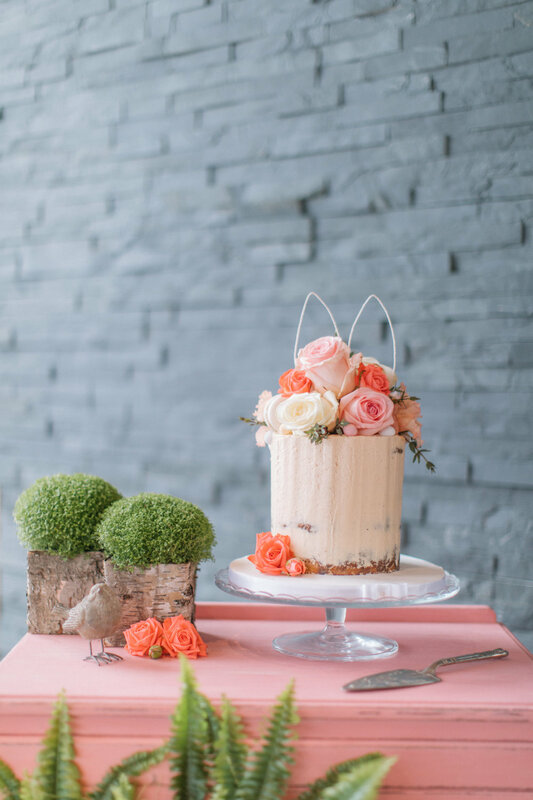 ‘Naked cakes’ are very popular at the moment and using fresh flowers in pastel colours really captured the essence of the season. My favourite elements of cake making are the little details that add interest. In this case I chose to use beautiful handmade bunny ears and mini chocolate eggs to celebrate Easter. Complimenting the nature of the venue, the flower arrangements by Hybrid Flowers were tall and rustic. Always going above and beyond, Hybrid beautifully styled the venue’s ornate chalet-style dining table and chairs. Bringing the egg hunt to the table, they even tucked Easter eggs into the wonderful centrepiece. The Mixology Brothers provide and host cocktail parties. Equipped with their rustic bar, they create simply stunning cocktails that taste delicious. For Easter inspiration a collection of cocktails were served following a spring theme. A gorgeous lemon tipple was served in a tall glass with a eco-friendly metal straw, finished with a beautiful matching yellow flower. Our favourite was a peach coloured martini style drink served in the always glamorous Coupe glass. Details were never forgotten here as each cocktail was styled to include a gorgeous sprig of spring. Locate to Create bring together a stunning collection of vintages props and decorations. Founder, Holly Dallison gives us an insight into the inspiration behind styling a show-stopping Easter brunch, lunch or dinner. The Travelling Hands are known as London’s best acoustic roaming band. Whether you’re hosting a private party or large scale corporate event they guarantee to get your guests moving and singing, a lot! “Our performances are all about good times, good music and high energy. We had the perfect setting for this at the simply stunning Amber Lakes alongside some brilliant suppliers. We had great fun showcasing this style. What’s more, when the Mixology Brothers, invited us over for a drink or two at their brilliantly charming bar, we couldn’t turn them down. It’s a tough job, but someone has to do it! In case you were wondering – they were all delicious! Looking ahead to spring and summer, we’re delighted to showcase our new blue tweed suits via our continued sponsorship with British Menswear Designer Marc Darcy. We love the new style and are very proud to wear these great suits at our events. Accompanied with red velvet bow ties, they bring a fun playful look for these warmer seasons whilst maintaining classic British style.” Hybrid specialise is creative floristry, working with every detail of a client’s brief and piecing together a masterpiece. The styled shoot was not exception. We talk through the design process and inspiration with Creative Director, Caroline Ball. “For the main table design the centre piece was the most beautiful ‘tree’ made from magnolia branches. Surrounding this we made a tablescape of quintessentially spring and Easter elements. This included the cutest pale yellow primroses, bunches of Muscari grape hyacinths and snowflake flowers. To top it off they were all set on to slices of logs or wrapped in sheets of bark. At Hybrid we have a bit of an obsession with ferns and we relished the opportunity give a fresh woodland element. We achieved this by wrapping ferns in green moss and hanging them in the branches ‘Kokedama’ style for a fun element. Touches of yellow santini and the sweetest foil wrapped Easter eggs were hidden amongst the branches in hanging glass globes! We wanted to work with the warm tones of the timber, antlers and of course our wooden bunny friend with springtime pinks and peaches. Our star flower was undoubtedly the stunning ranunculus. This worked beautifully with the peach avalanches roses, snowflake flower and green ferns. A cooler blue element was added with little heads of cute succulents and silver coloured bark containers. To conclude, zingy yellow forsythia and the most beautiful open scented freesias will always tell us that spring is here. Their vibrant florets were highlighted with touches of green viburnum and ferns. These were brought to life further with pops of orange toned roses, purple stocks and alliums reminding us that early summer is not so far away!" Click here to view all of the photos from the shoot, and here to read the full article on Pearl & Pear.